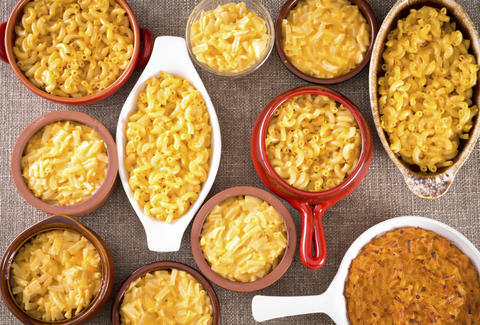 In celebration of this dream team of starch and dairy, we've compiled a list of the 21 best macaroni & cheeses in the country. 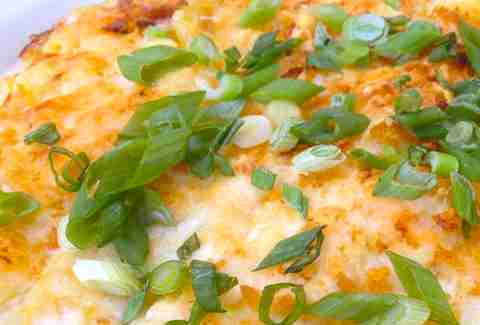 Although we did include a few bolder iterations, these mac & cheeses err more toward what mom used to make rather than truffled slight of hand from Michelin-starred chefs. 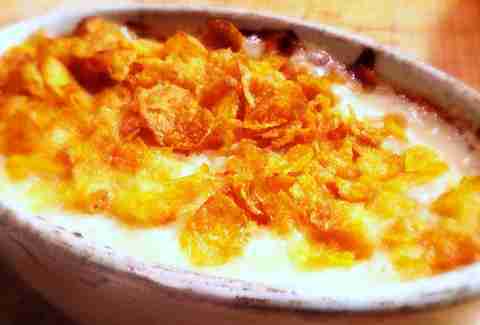 With a dish as personal as this, everyone has their own favorite, which we expect to hear about in the comments. Just be sure to wipe your fingers before typing. 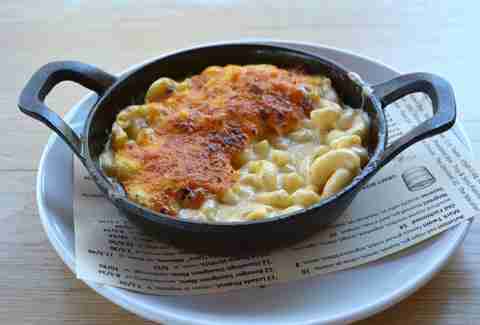 Orecchiette, shells, cheese mittens... call them what you will, American Social delivers a skillet of mac that is one of the best things our Miami-based writer has ever put in his mouth, which is saying a lot. You can choose your own adventure in terms of protein, but the best match for the Vermont cheddar and Gruyere is the braised short rib or the wild boar, which is flavorful enough to hold its own against even the sharpest of cheddars. 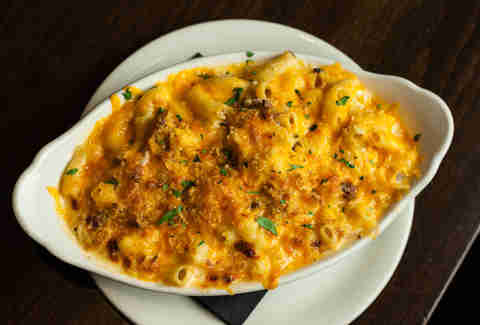 Barbecue joints are usually too focused on keeping the fires burning to spend too much time on sides, but Slows in Detroit makes time for a masterful mac. 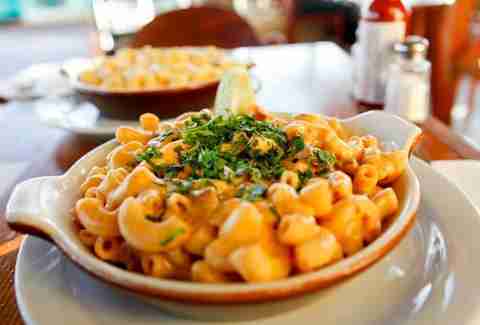 To the disbelief of customers who laud its luxurious flavors, its must-try side is fueled by only cheddar, béchamel, and more cheddar. 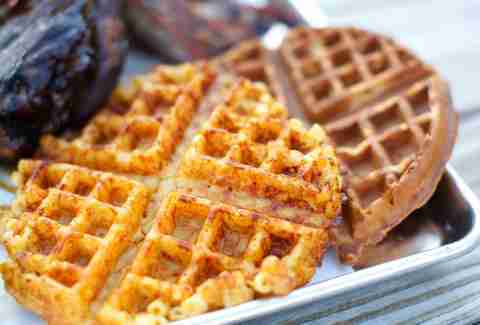 Waffle iron hacks are nothing new, but rarely do you see a restaurant pumping irons to the limit like Arrogant Swine. The Carolina 'cue experts here make the list partly as a reward for a pitmaster putting extra oomph into a usually boring barbecue side, but it's proven to outlive novelty status by nearly outranking the chopped pork as the restaurant's most popular dish. Don’t get distracted by the giant lunches of pork belly or lamb or pastrami: Donald Link may’ve opened Cochon Butcher as a meat-centric sandwich spot to accompany his dinner-focused Cochon, but the move here is actually the side of mac. Nothing shows off pancetta’s smoky, crispy, meaty deliciousness quite like burying it in incredibly creamy cheddar and white wine sauce that has just the right hint of tomato paste. Feel free to save the BLT for after. And definitely leave with duck pastrami and Kurobuta bacon (it will, in fact, be the best bacon you’ll ever taste) from the deli case. But trust us: start with the mac. 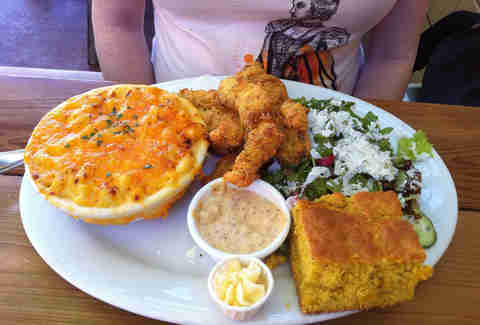 Comfort is king at California's iconic chicken & waffle joint, and the baked side of mac & cheese fits right into the lineup of soulful foods that go down as well in the morning as late night. It's perhaps the most basic version on our list, but the simple creaminess earns it Most Like Mom Used To Make honors. And mom is always at the top of our list! 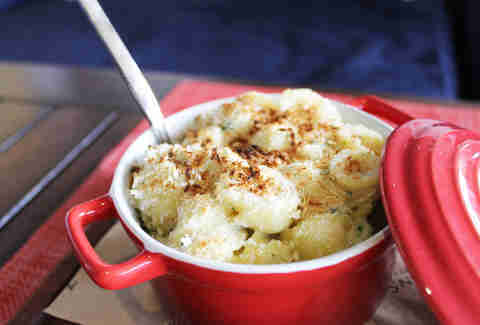 In the canon of mac-friendly cheeses, American is often overlooked. Not so at Steuben's in Denver, where they mix both yellow and white American with fontina, Camembert, and Swiss for one of the most complex, but still classic cheese medleys on this list. 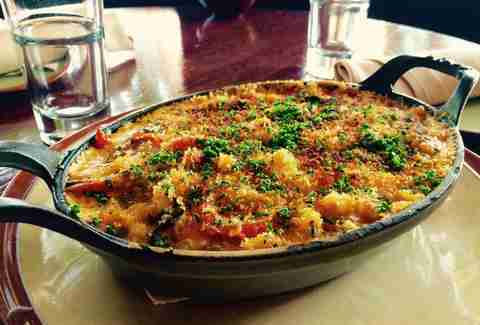 Adding lobster claws to mac & cheese is like bringing a gun to a knife fight, but since it's become so common for seafood shacks to fight dirty these days, we'd be remiss not to include one crustacean-topped cheese bomb. 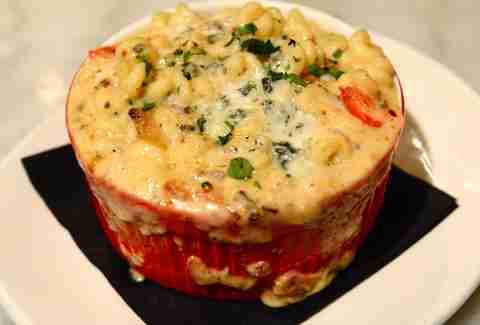 Smack Shack boasts the biggest lobster tanks in the Midwest, but even without the lobster, its mac is an undeniable winner thanks to rare ingredients like white wine, semi-soft taleggio cheese, and corn, plus a handful of white American for good measure. Any restaurant with a day of the week specifically devoted to M&C deserves your respect, but Golden Beetle in Seattle is worthy of downright unbridled admiration. Start with a pitch-perfect bechamel (spiked with either garlic or harissa), then choose your own cheese-venture (white cheddar, smoked Gouda, Gruyere), and if you're going all-in there are plenty of choices of protein (local bacon) and veggies (kale, of course). 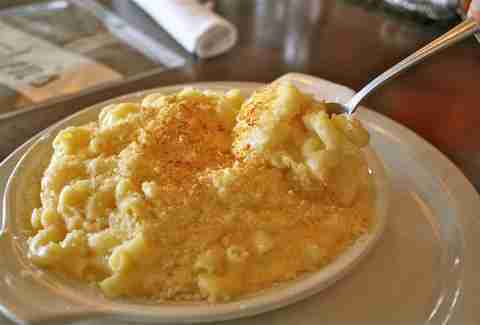 During the eight-month Boston winter, there are few things better than trudging in from the windy cold hell and going subterranean to Downtown Crossing's beloved Silvertone, getting yourself a booth, a beer, the Weekly Dig, and ordering its famously intense, creamy mac & cheese. They give you a variety of options to top it, ranging from peas (NOOOO) and steak (nooo? ), but the only real move is to get it with bacon, and ask for some hot sauce, or -- if you truly want to spend the winter only wearing snow pants -- that Tabasco butter sauce they give you with the jerk chicken. Each of the 10 choices at the mac-only Oakland cafe Homeroom has its strengths, but our money's on the Sriracha Mac, which transcends hot-sauce fads by upping the Asian flavors with ginger butter and scallions, but using a more neutral cheese like Gouda to balance things out. Dan Gentile is a staff writer on Thrillist's national food and drink team. He has strong opinions about the best grocery store mac & cheese. Follow him to Crazy Bugs for dinner at @Dannosphere.